I am sitting at my computer this morning in complete silence. The boys are with their grandma, Makenzie and Morgan are sleeping, Haley is with her grandma, and Zakk and Erica are at the hospital with Emily. While I dearly love my family and friends this moment of silence has been kinda nice! Yesterday Makenzie and I headed up to the hospital in the early morning to be with Erica during a surgery to place a g tube in her daughter. It was a super hard decision because Emily can eat but she is not eating enough to grow properly and every meal is a battle. So yesterday was the day. Everything went super well and in kid fashion Emily made a liar out of all of us by eating her whole dinner. I guess when it has been almost 24 hours since your last meal, hungry is an understatement... even for a kid who hates to eat! I took Makenzie and Morgan home in the afternoon and we hung out. We had a showing scheduled between 6-7:30pm but I decided they were going to have to look around us because Morgan was down for a nap and Makenzie was eating. I thought they were a no show until the doorbell rang at 8pm. I rushed downstairs with a wet, just bathed Morgan, and opened the door. They looked at the house and left. The agent apologized for being late and said he should have called.... hmmmmmm ya think? I had both kids bathed and in bed by nine with enough time to sit down and watch teen mom before heading to bed. I figured I would up with Morgan several times last night because that is his style but nope. I fed him a bit before I pulled the covers over me at about 11pm and he is still sleeping! Yeah me!!!! So the business continues! Today is going to be a good day! Emily is safe, doing well and should be home today, I got to sleep last night, the boys will be home, and so far we only have one showing scheduled! Off to go start the morning pick up!!! I remember one of the first thoughts that crossed my mind after Makenzie accident and realizing how bad her injuries could be was that she was my only girl. I remember hugging my cousin and sobbing. I sobbed about the loss of slumber parties, nail painting, dressing up, pink pretties, and princesses. My cousin looked right into my eyes and assured me that I would still have those things. We went to American Girl!!! I was not sure how Makenzie would react but I had high hopes. She blew my hopes right out of the water! Makenzie loved every second. We touched and looked at everything. She smiled and laughed and made it very clear which doll she liked best. Of course mommy had to buy it for her! As I walked around the store I watched all of the other little girls milling around. They all had the same look of sheer joy that Makenzie had. They touched and begged, and then touched some more. I stopped for a moment and just took it all in. Then I wondered if their moms appreciated this experience as much as I did. I wondered how many of them begrudgingly came just to appease their child. I wondered if anyone in that store truly understood the beauty contained with in those walls. I sure did! After we were done at American Girl we headed to the mall to get a replacement shield put on the iPad and then out for lunch. Then to add the icing to the cake... literally... my mom brought over an super yummy ice cream cake! So tonight before I put Makenzie to bed we had sparkling cider and cake with a toast to Makenzie and four more years of healing and joy! Thank you all so much for your support over the last 4 years! God is not done with my little princesses yet! I am pretty sure my life has hit a new level of crazy! I am finding it harder and harder to sit down and write. For that I am sorry! I have been thinking a lot lately about life amongst the craziness. I have been reflecting on how different today was four years ago. This very evening on March 24th 2007 all of my four kids were tucked into bed. My husband was at home and I had gone out with some friends to a comedy club downtown. I came home and checked on my kids before heading to bed and all was well in the world. Today four years later all is still well in the world. It has taken some time to get back there but even though it is hard to really put words to I am there. This family has become part of a whole new world I never would have given any thought to 4 years ago. A world filled with the most kind hearted, amazing people, who I would have never met. A world that I have learned over the last 4 years to exist in while at the same time co existing with the rest of the world. It is a world of very interesting words and what has seemed like a whole new language. Then there is the new uncharted government systems containing doctors, insurance companies, home health care companies, therapists, waivers, equipment, and many battles to get Makenzie what she needed. It has become a world that I can navigate with my eyes shut. Tonight as I watched my boys make a obstacle course and then see who could race around it faster in a wheelchair made me smile. Then when I put my coat on and reached into the pocket to find a 10cc syringe I had to giggle because all of these little things have just become so normal to me. I can't see my life any other way. March 24th 2007 at 9:33pm, I had no clue what was to come in just a few short hours. I only knew then that tomorrow would be a new day! It sure was not the day I expected but a day I will never ever forget. It is a day that brings an attitude of gratefulness for many blessings and much healing every year. It is a day that I can look back on and see the many huge Miracles God has abundantly given to our family. March 25th 2007, where were you? It is done. It was once again a very interesting experience. We headed to the school, Just Mr 13 and I. On the way there at about 3:10pm I get a call for a showing between 3 and 5pm..... hello? It was already 3pm. I guess we will need to have a little chat tomorrow with the showing company because I need at least an hours notice to get all my ducks in a row. At the school of course the principal was in a meeting and the secretary was super rude as usual. I have decided she could teach eye rolling 101. We got records, cleaned out locker, talked to a couple of teachers, returned books, and finally gave up on the principal finishing his meeting and handed the intent letter to the secretary. There were mixed emotions but after witnessing a scene in the hallway between one teen and a screaming security guard, my heart felt much better. Tomorrow I am going to work on getting Mr 13 re enrolled in Orchestra class and be done with all of the politics. He really has been a totally different child. He has been so sweet ( don't tell him I said that! LOL) and such a huge help. Other then that we had a great day! It was Erica's birthday so we went to lunch and did a bit of shopping. It was cold and windy so the shopping was a bit short lived. As we backed out of the parking spot Makenzie began to cry! She wanted to do more shopping! I just love that girl!!! Tomorrow is another crazy day! Please continue to pray for the perfect buyer for our home. I don't know how much more of this showing I can take! LOL I will survive! My First Power Chair Trial! That was the theme of today. We started our day out bright and early to get ready for an appointment downtown for a power chair evaluation. I was so excited about this appointment. We have been talking about trying Makenzie in a power chair for a long time. She tried one before she got her new seat at a DME Expo a while back and she loved it. I knew she understood it and now we were finally going to see if she could get past the physical challenges of driving the chair. We have done most of Makenzie's recent seating projects through APT. They have a seating simulator that serves many purposes one of which is power trials. We started with one switch at her elbow and let Makenzie spin in circles. She giggled and laughed so hard. Then the therapist added a second mechanical switch next to her head. With a head switch you are supposed to tilt your head to activate it. Makenzie thought it better to turn her whole head and smush her whole face and eye into it. So they traded the mechanical switch out for a proximity switch and she did much better. It was so wonderful to see Makenzie moving. Even more awesome was to see her do more then spin and actually go where she wanted and be able to stop and go on command so many times! It was not to long ago I recall dreaming of this day. I remember hoping and dreaming one day Makenzie would be able to have some kind of independent movement. I can't believe today is here and she is walking and driving herself all over the place! God is so so so so GOOD! We headed home for Makenzie's speech appointment and for me to clean for our first showing!!!! I had two agents that wanted to show my house today but had to tell one no because Makenzie had therapy and they count come later. I guess that is how this is going to go because my life can't stop and Makenzie can't miss therapy for someone to maybe come by for 10 minutes. By the time the hour was up Makenzie had had a ton of fun, the house was clean, and we were ready to load up in the car to run a few errands on account of getting kicked out of the house. We made it to Target, Petco, and picked up some lunch before heading back to the house for OT. I think I am going to make a T-shirt that says " I had my first showing..... and lived to smile about it!" Well I decided to spend the last 24 hours cooling down. Yeah that's how well the lovely meeting at my sons school went. I am so sick and tired of all of this. I walked into the school office exactly on time. I made extra sure to do this because the last time I was 10 minutes late and the person I was meeting with had already moved onto something else and the meeting did not happen. When I walked in I heard the principal tell the secretary to have me take a seat because he needed to make a phone call. I told the secretary that my daughter needed to eat in 45 minutes and I had another appointment scheduled shortly after. She proceeded to shrug her shoulders and roll her eyes. I sat and waited for 20 minutes. We sat down and he asked me what was going on, to which I told him that my son was miserable at school. I gave him a few examples and then his response came which rendered me almost speechless. He suggested that since I had already written the school off we needed to find a new school for Mr 13 to go to! WHAT! Somehow my concerns about what was happening TO my son meant that I had written the school off? I looked at Dr. Principal and almost laughed. Instead I said with much agitation... So, You don't want to deal with this..... is that what you are telling me? From that point on the conversation took many twists and turns. My son got blamed for not turning in incident reports, he questioned why I had never talked to him before yesterday even though I have talked to everyone else involved numerous times, and suggested that we should not focus on how my son felt but instead on what was going on with him. The final straw for me was when his solution was to have a big huge pow wow with the dean, counselor, teachers, and himself, after they did a bunch of testing on Mr 13 for special needs, learning disabilities, and behaviour disorders. GASP! WHAT?! Mind you my son has gotten nothing but average and above average scores on all state testing and has never been in trouble for any kid of bad behaviours at school! So that fact that my son has been treated in ways no human being should ever be treated somehow got turned into my very smart and incredibly responsible son having learning disabilities and behaviour problems. So very far from what is going on! REALLY?!!!! I am just sick. I went in there hoping some one would have some empathy and stand up for my kid letting him know what a great kid he was and that he would not be treated as anything less. I left knowing that my child would never be made to feel like that but most likely would be made to feel even worse about himself. I drove home sobbing. I was so scared for my little but not so little anymore boy. I was so angry at the place that should be rooting for and protecting my kid but instead chooses to turn their backs to the real issue. So sad. Needless to say Mr. 13 officially had his last day of 7th grade at the public school. On Monday I will be going up there with him to get his records, turn in my intent to home school, and get all of his possessions. I have already purchased and enrolled him in a Christian based homeschooling program and he is SO excited. We are going to start at the beginning of 7th grade so he can catch up what he has missed this year. It has been great to watch him walk around smiling and overall a different child. I watched a weight come off his shoulders in that moment and this mom could not be any more sure about the decisions that were made in the last 24 hours. Even though this adds more to my daily load, I feel so much lighter too. Well I felt lighter until two of my boys started puking this evening! Please pray that one one, else especially Makenzie gets this stomach bug! Makenzie thinks Morgan is great! This afternoon my friend Erica showed up. It was so good to see her and Mr. Morgan. Makenzie sat and giggled every time he would move, make a toy sing, or yell. It was almost uncontrollable. At one point I was trying to talk on the phone and I could hardly have a conversation because she was laughing so hard. Even cooler, after having not seen Erica or Morgan for over two months I asked Makenzie where Morgan was in a room full of kids, and she looked right at him. There was no lag time at all. Fun, Amazing stuff! I got the appraisal results back on the new house and included was a few pictures of the house. Erica and I sat and looked at them for a good long while. It felt so good to finally share this with a close friend. We sat at the computer talking about how much she loved the house and how we would be able to modify it to meet our families needs. It really is the perfect house and I am getting so much more excited and less stressed about all of it everyday! I have still not decided what I am going to do about Mr 13's school situation but I am praying for answers and am also very interested to hear what the principal has to say about it all. In the mean time I decided to pursue an activity that Mr 13 has shown interest in for quite awhile. I surprised him this afternoon and he could not have been more excited! Thank You Michelle! I love and miss you dearly! I am hoping this will give him a positive outlet that will help him begin to heal from the trauma he has endured the last couple of years and he will find friends who will like him for who he is! Man I love that kid! It is now time to sit down and have a margarita with my friend..... we have a lot of catching up to do! 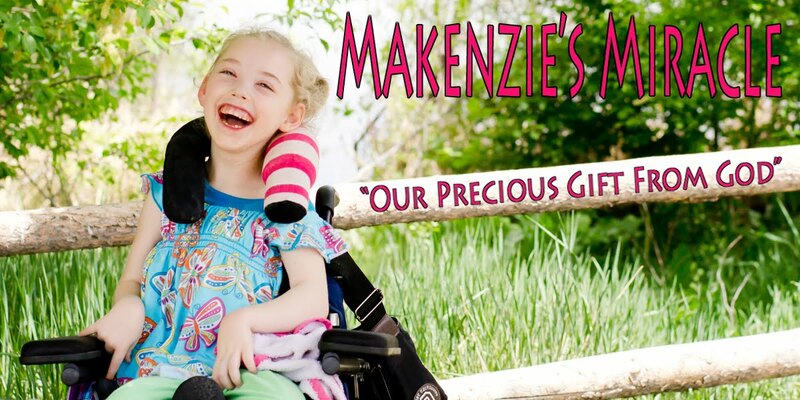 As many of you already know feeding has been a huge issue for Makenzie since her accident. We have struggled with reflux, vomiting, failure to thrive, and just plain ole tummy pain. I tried just about every formula with Makenzie before we put a gj tube in. She gained some good weight, still vomited a bit but overall was much happier. In April when her GJ tube broke on a Friday morning in April 2010 we were forced to try the straight G tube again. Makenzie did well! However I had to figure out what the heck I was going to feed her. Makenzie has a delayed food allergy which was confirmed several years ago after receiving results from a blood test performed by Sage Medical Laboratory to many things. Some of the big ones are gluten, casein, lactose, beef,and corn. These are not allergies that will cause her to break out or go into shock but allergies that cause her more reflux, vomiting, and overall discomfort. So with a list of things Makenzie couldn't have I set out to find a diet which would provide her everything she needed. It took a lot of experimenting and many failures but in the end with the help of my good friend Michelle I found a diet and schedule that worked! Today I got confirmation that the diet I have come up with has produced perfect results on the full blood panel that was run a couple of weeks ago! Makenzie is getting EVERYTHING she needs! I am really quite proud of myself because no one thought I could do it. I guess I am not just a clueless mom after all! So before I go on..... I want to disclose that I am not a doctor nor a dietitian. This is what works for Makenzie. It may not be right for your child but I wanted to offer a starting place for those who are thinking about a blended diet for your child. Please check with your doctor before changing any part of your child's diet. Makenzie is on a four day rotating diet. This means she does not receive any of the same foods other then formula with in a four day period of time. The rotating diet helps ensure Makenzie's body will not form new allergies to additional foods. The first and most important step to a successful blended diet is a good blender. The Vitamix comes highly recommended and with a letter of medical necessity can be purchased at a discount through Vitamix. I start with water and formula. I have tried every type of multi vitamin nor any other kind of non dairy milk but Makenzie has not been able to tolerate any of them, so the formula has stayed. Milk of the cow, nut or grain variety can be substituted if a multi vitamin is used. I then add juice. Makenzie gets blueberry, grape, prune, and cranberry pomegranate. All organic. After this is mixed I add a 3.5 oz patty of meat free range, hormone free, that has been weighed and cooked. The meats that I rotate are, lamb, chicken, pork, and turkey. I tried salmon and mahi mahi but neither made Makenzie's stomach happy so I had to settle for two days of poultry. I then add in a vegetable. Broccoli, cauliflower, peas, and carrots seem to work best for Makenzie. I also tried greens (spinach, mustard greens, kale, and chard) but those caused much more reflux so we stopped. I then move onto the grains which are all gluten free. ( buckwheat, quinoa, potato flakes...yes I know it is not a grain but it is a carb....and rice) Agave, and olive oil. Last but on least the fruit. I have promised my self at some point I will use fresh but I haven't gotten there. So baby food works for now. Makenzie gets a rotation of blueberries and pears, peaches, apples and bananas, and mango's. Beachnut brand provided the most calories along with Target brand peaches. As soon as this lovely concoction is all mixed up I measure it up into a clean feeding bag and two 8oz bottles and we are good to go for 24 hours. In total I think it takes about 15 minutes a day to make her formula and other then the meat there is no cooking involved. Makenzie also gets about 600cc of free flow water as well at night on top of her three feeds throughout the day. If you are interested in more specific info on the blended diet from a parent, not as professional advice, shoot me an email. We started this week with a bang. Makenzie had Speech which went very well. They played with bubbles, and read several books. Makenzie made it very clear when she wanted to do it herself. Last week we added the "I want to do it myself" button and I am pretty sure it is the best dang choice on her talker! After speech we headed downtown for what was supposed to be the first of three appointments to evaluate Makenzie for a power chair. We got a bit side tracked with adjusting her chair and by the time we finished there was not enough time to get Makenzie all set up in the simulator. So the therapist took measurements of her chair and next week she will be all ready to slide Makenzie's Aspen Chair into the simulator and start trying out different switch points. I am so excited because as soon as we get moved into our new house they should have a power chair all set up for Makenzie to borrow and practice in before she gets her very own! So instead we took a look at the positioning bed. Makenzie loves to sleep in a ball on her side. This is horrible for her spine and hips. We took some time to set it up and Makenzie melted right into it. She was straight and long and very comfy! We go back in on Monday so we will talk about the bed a bit again then but I am hoping we can also trial that at home soon. The process to get one without paying for it out of pocket to the tube of about $5000.00 will be a long battle but there are many who have won. So I guess I am now gearing up for 2 big battles.... a power chair and a bed! Ahhhhhhhh Not to mention I am hoping to get Makenzie back in school next year which will require a good attorney and a transition meeting before June...... Geez! This after noon Makenzie and I took a little rest on the couch. If there is one thing that makes me happy it is curring up and cuddling with Makenzie. However she has decided that there is too much going on around her and she is much less willing to just lay with me these days. While I was resting she rolled herself right on off the couch three times. I was holding onto her so there was no real falling involved and boy was she ever proud. I decided since she was on a roll..... literally..... I would video it. Then tonight it was super nice. The boys were playing outside. One of them came in a walked past Makenzie and turned around and went back outside. Makenzie's lip came out and then came the tears. I looked at her and then asked if she wanted to go outside. I told her if she did she needed to smile so I would know. Immediately she stopped crying and a huge grin crept over her face. So out we went. She watched the boys ride bikes, and skateboard down the drive way and as soon as she was done with her dinner, I got her out of her chair and she chased the boys with mommies help! Amazing times! Now all is quiet and I am ready to head off to bed! God is so good! What a wonderful Monday! Today started with snow and ended with a beautiful spring like day! While Makenzie was eating dinner we headed out for a walk. The sun was below the horizon and it was perfect! I have been so tired lately and the silly time change did not help this morning. Tonight I am going to shut it all down early and hope to feel better in the morning! Makenzie's procedure is over, the house is painted, the carpet is in, and most all of the other major projects were completed today and I felt an amazing amount of stress leap off of my shoulders today! As I looked around my home this evening all put together, I was overwhelmed by the beauty of my life. After four years of medical crisis, exhaustion, and overall busyness, finally taking the time to turn my house back into a home has been breath taking! The sad part to this story is we did all of this so we could move out. Funny how that works! Hopefully by this time next week our home will be on the market. It has been a fast and furious journey and we are ready! Please say a prayer for the perfect buyer! God's timing in all of this has been perfect and we continue to stand in complete trust that God will finish what he started! While I sit here in what feels like the chaos of my life, the shock of shifting ground and the raging seas take many lives and paralyse an entire country. While I feel the stress of all of the many things that need to be done in my life, a mother was saying her final goodbyes to her little boy after they decided to give what was left of his short life to others. While in the midst of being completely exhausted I am sitting here thinking about how blessed I am. My life is nothing like what I had ever imagined it would be but my daughter received a miracle which many today did not..... life. Today I thought a lot about how different Makenzie's story could have turned out. Today I gave all of my kids an extra squeeze and for a while just let the worries in my life go. Today I watched Makenzie in her walker and felt guilty for being tired of turning her around every time she hits a wall. Today when I looked at my boys, I watched intently as they tossed around a football, memorizing their faces and enjoying their smiles. Tonight I could not love the 70lb wheel chair I get to lift everyday. The weird looking walker and stander which decorate my family room makes me smile. Every single fight with the insurance companies, school districts, and, doctors, is such a blessing. Four years ago I expected huge miracles. There have been days that I have pleaded with God, I have yelled at God all while wondering when Makenzie's huge miracle was going to come. You know the walking, talking, sitting, eating variety. However, more and more over time as I look back at the last four years I realize that the miracle's God has given to Makenzie and this family have been huge. She may not be talking and walking but she is alive. Not only is she alive she is happy, healthy, and healing a little bit every day. She is beginning to follow directions very fast and learning how to control her body on command. Today as we laid on the couch together listening to the constant banging of the contractors while they installed our new carpet, I asked Makenzie to straighten her legs and put them down on mine. She did it! Makenzie knows what she wants and has been vocalizing more and more every day. I have been hearing some new sounds and she continues to say "yeah" when she wants something. I feel a bit more everyday like "real" words are right around the corner. She is a miracle.... a huge one!I truly believe that with all of my heart! That is not to say there are not hard times. The times when I feel like no one on this earth has it harder then me. I believe everyone feels that way at one time or another regardless of how different our struggles are but then there are days like today that reach out and slap us in the face reminding us of all of the things we have to stop taking for granted! Hard...... I ain't got it hard..... and really I don't. Pray for the people of Japan. Pray for little Avery's family as today they said their final goodbyes to their baby boy. Life is hard for all of us sometimes but please take sometime to thank God for what He has blessed you with and then pray for those that have it harder then you do! Makenzie worked so hard today! Her legs are so loose but perfect loose! She is bearing weight, long sitting, ring sitting, and Indian sitting, great and that makes this mommy very happy. She is also moving her legs a ton more! This morning she decided that she wanted to get off the couch so she rolled over, put her feet on the ground, looked up at me, and then I caught her before she toppled over onto the ground! She was so very proud! Even though the whole injection process was stressful, it was most defiantly the right thing to do! I am hoping we can use this window to strengthen the smaller muscles in her legs before the Phenol wears off so that there will be no needs for any more stressful procedures. We can not do any active stretching until next Thursday but here is a picture of how loose Makenzie's aductors are with no effort! Other then that we had a busy day that just ended for me with the painting of another wall in my house. Today we painted. Ok, my mom and grandma did most of the painting while I ran back and forth between the roller and Makenzie. Days like today make me so much more excited to move. Having a ranch house will not fix everything but it will defiantly make life easier. Taking care of Makenzie is such a great job but it is enough to fill most of the day all by itself. She is a great kid. She is happy, and not overly needy. However, her day is very chopped up between therapy, eating, errands, and simple 5 year old play time. Today we brought her chair upstairs for a while after lunch so she could be around all the action. She sat and played with her iPad, babbled and just watched. After a while she got fed up with her chair and my uncle had sprayed some more texture so I took her back downstairs and laid her on the mat. I put a few toys around her and headed back upstairs. I hated that she was downstairs all by herself so I was up and down. Just as I would pick up the roller she would holler. I would march mack down the stairs, give her some attention, and then head back up. After a bit of this I just got plain frustrated. She wants to be a part of everything and I want that for her. Moments like these make me realize why it is sometimes so hard to get anything done and or why I lack motivation. The back and forth between what needs to be done and what Makenzie wants and needs is exhausting. Having everything on one level will be amazing. Being able to push her into each and every room to put away the laundry, sweep, wipe down the bathrooms, and so on, will help. It will help her be a part of everything and it will help me to be able get more done with many less interruptions!